Building an intelligent IVR system with a Bot handling the interaction with your end users and bringing in humans based on pre-defined events would bring a lot of automation and remove mundane manual activities which takes up lot of time for a person. This can be achieved using cloud services provided by cloud providers such as Amazon, Google, Azure etc and communication service providers such as Twilio. The above could then invoke other AWS Lambdas to create further actions. 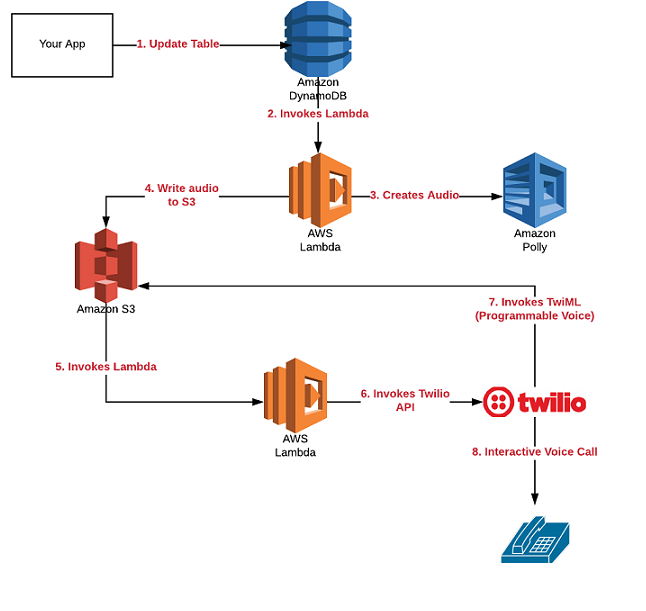 The following is a sample/reference application architecture representing a custom IVR system built using different AWS services (DynamoDB, Lambda, Polly, and S3) and Twilio. Play the query message created using Amazon Polly and stored in S3; Ask user to leave feedback message at the beep and press star key, “*” on finish. Record recordMessage = new Record.Builder(). The following is the sample TwiML file which gets created and stored on S3. It is later played by Twilio as a result of outgoing call to the destined user. In this post, you learned about creating or building a smart and an intelligent IVR system using Amazon ML services such as Polly, Transcribe, Comprehend, Lambda etc and Twilio Programmable Voice APIs. Did you find this article useful? Do you have any questions or suggestions about this article in relation to building IVR using Amazon and Twilio services? Leave a comment and ask your questions and I shall do my best to address your queries.